Out West Fishing Report-Special Edition with Tim Sheehan | Hookers Fly Shop and Guide Service. Your Smokies Fly Fishing Experience. The season is just heating up for the Wind River Valley. The middle fork of the Popo Agie through Sinks Canyon outside of Lander, WY is producing 30 fish an hour, mostly in the 10-12 inch range. The 16 inch brown coming every half hour. These fish are taking tungsten caddis puppa I will call the Sgt. Pepper. 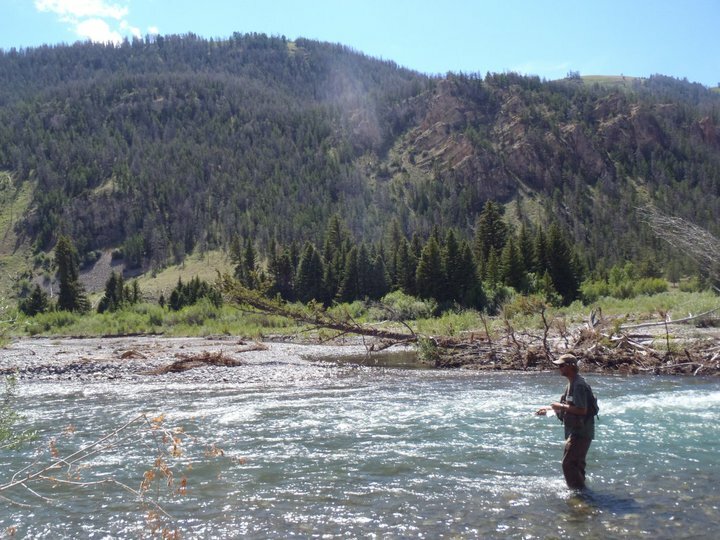 The Yellowstone’s Madison, Gibbon, and Firehole Rivers fished excellent early in the season, with 3-4 fish per hour. Water volumes decreased in the Park earliest, with browns and rainbows eager to put on weight while they could. The prize came on a windy day on the Madison when a famed trophy brown took a #10 Czech Caddis. The fish are truly larger on this river and the landscape is breathtaking. As far my home town water (my favorite places on Earth, the East and Wiggins Forks, the Wind River, they are just now clearing up. The cutthroat numbers are outstanding with 30 fish per hour taken on mostly Peppers and weighted flies. Many fish have been taken on the swing. As conditions on the Wind River I continue to improve, I expect to see larger fish, brown and cutthroats taken this next week. The hopper season is here and I have been tying foam for the last couple of days. Time to break out the dry-dropper rigs. I miss you guys back home and can’t wait to fish with you in September.